Summer and Fall produce is delicious! We raise potatoes, cabbage, zucchini, broccoli, cucumbers, peppers, sweet corn, melons, okra, cauliflower, tomatoes, green beans, squash, and so much more! Enjoy healthy, locally grown produce "Fresh from the Farm to You". We are proud to open our onsite Farmer's Market. Stop in anytime to shop with us. Do you need large orders for canning, freezing or large gatherings. 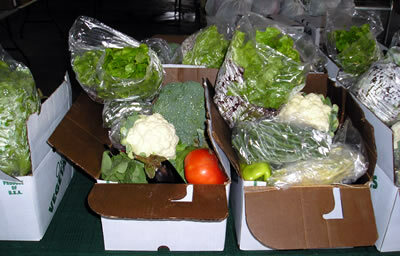 Call us for special orders of large quantities such as cabbage, tomatoes, and pickling cucumbers. Want to plan ahead? We will place your name on our list and when the produce is available in the quantities you need, we will call you. We grow all our own produce, so you know the quality will be excellent. Call us for information on how you can order weekly share. Enjoy the flavor; there is a difference in the taste and nutritional value of produce grown at Hilltop! As a member you will purchase a share of the harvest. In return you receive a weekly quantity of 1/2 of a bushel box (14.5X11.6X8.1) of the highest quality, sustainably grown produce from our farm. Shares start mid-June and run for 18 weeks. Shares are limited!